Are you looking for your customers to purchase more frequently, to buy in greater volume, or to sell new/different food and drink options to them? Are you looking to bring in new customers? Are you looking to promote to lapsed customers to give you another try/to convert them from other options they have available? Whilst you cannot achieve all these outcomes with one promotion, a limited time offer will target the widest audience. Below we have some top tips to help you decided on which option to take. Personalisation in all forms of promotion to your customers is becoming more and more important as customers are expecting their differing needs to be tailored wherever they go. You should always consider providing alternative options on your LTOs, such as, gluten free and vegan, so that you can please all of your customers when running these promotions. Not only this but you should also consider your customer segments and the type of deals they would be interested in, such as, if they are indulgers or if they are looking for healthy options, before running such campaigns. Although it is important to repeat promotions if they have been very successful to encourage similar success again, there is the danger that customer’s may only choose to purchase the food/drink when they are on these LTOs. This may mean limiting these campaigns on products to certain times of the year based off of seasonality instead, or by incorporating the popular items onto the menu more. LTOs provide a great opportunity for you to trial new dishes to see how well they go down in your outlet. By applying an LTO to these new dishes, it encourages your customers to try the new meals as it provides them with the feeling that they are getting more value for their money and justifies trying the food even if they don’t like it. You can then use the promotions as a test to analyse sales statistics for the new dishes and to also speak to your customer to provide a steer into whether or not the dishes are something they want to see in your offering. Providing an exclusive LTO is a great way of drawing in new/existing customers and it also encourages customers to have a fear of missing out (FOMO). 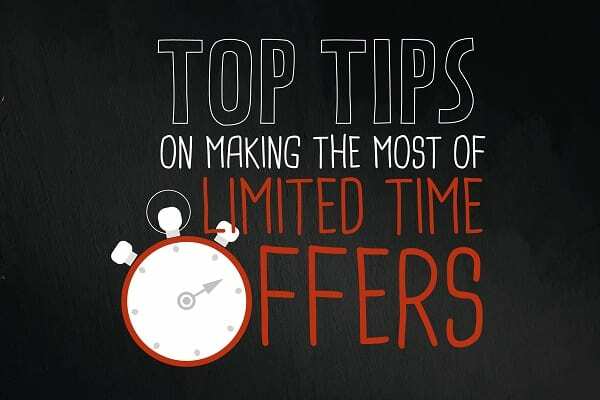 By stressing the fact that the offer is for a limited time, you make your customers feel special while imparting the message that they must act quickly to enjoy the savings you’re offering them. Everybody enjoys getting a good deal. If you provide a good meal choice at a good price, your customer will feel like they have received good value for their money. The important thing is that this in return helps to boost word of mouth promotion among your customers. In return, this vitally helps build a reputation for you and encourages your customers to come in time and time again. For more information and advice specific to you, get in touch with your account manager today.